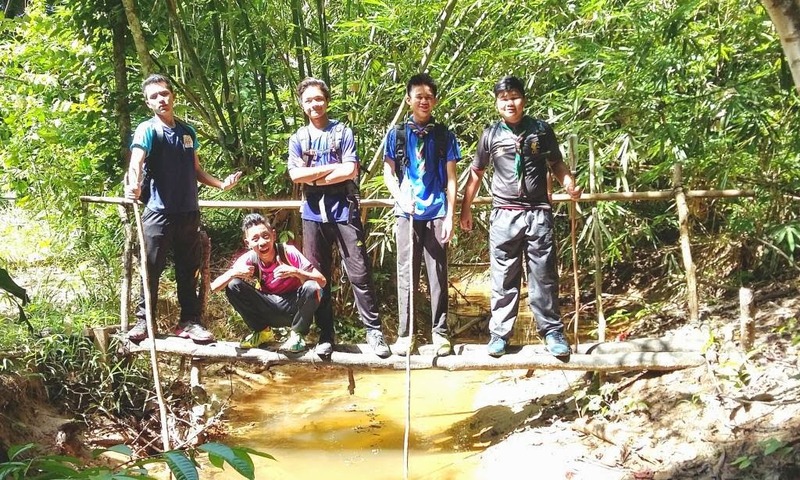 Senior Air Boys went trekking to Wasai Dadap as part of their learning to become future Air Venture Scouts. Venture scouts always knows where to go and how to go there. In a country with many biodiversity and natural waterfalls, scouts should know these places by heart. Unfortunately today some of the trails were lost due to thick undergrowth. The river path was blocked fallen wood and landmarks were unrecognizable due to land changes. But at least everyone had fun and learn practical knowledge about jungle trekking. That is whats important. Skipper Zack will refer this matter with the village leader and once cleared there will surely be another expedition with new members. December is when everyone looks for something to do during the school holidays. Some go away on vacation but some scouts wants camping. So the dedicated leaders got together and organized a 4 day camp to sharpen skills and gain some badges. SOAS College Air Scouts who were still in the country, formed up a team for the troop. Lead by Senior Patrol Leader under the guidance of a veteran Air Rover, Omar Ali Tahiruddin. 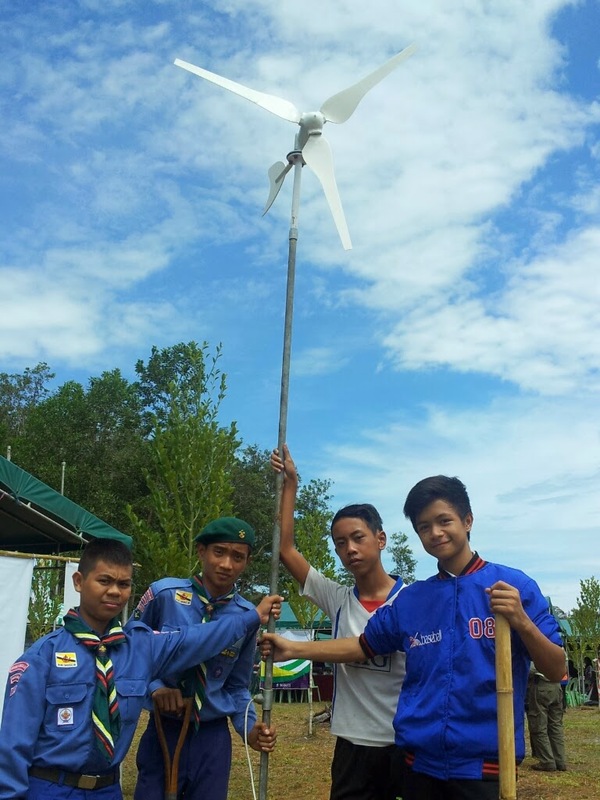 Scout members who have finished their exam spends their time learning other useful skills. One of which is Basic First Aid. Fortunately for Skipper Sakina who is the Commissioner of Health and Safety is also a Certified Instructor. Sanctioned under the Brunei National Resuscitation Committee the course is structured under national guidelines and at the end of the course, scouts would gained their certificates and first aid card. Patrol leaders from SOAS College Air Scouts, attended the course and paid on their own because they believe that such skills can be helpful in life and activities. So its worth $15. Not to mention how fun and challenging it can be. Providing first aid help is not as easy as on TV. Even on the basic level, taking proper steps and care takes some thinking and practice. With commitment, everyone pass and start making their own first aid pack correctly. Soon they will share this knowledge with the others. 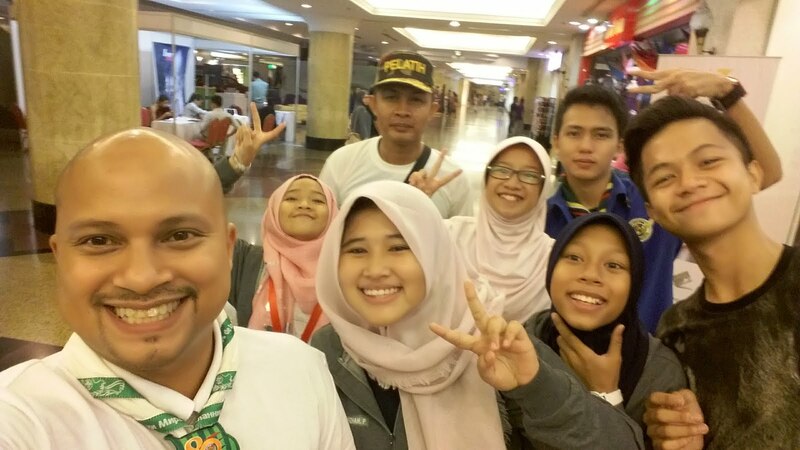 Visitors from Sabah Scout, Putatan District came for a short visit last weekend. SOAS College Air Scout was tasked to bring them around and was happy to meet up with other scouts. 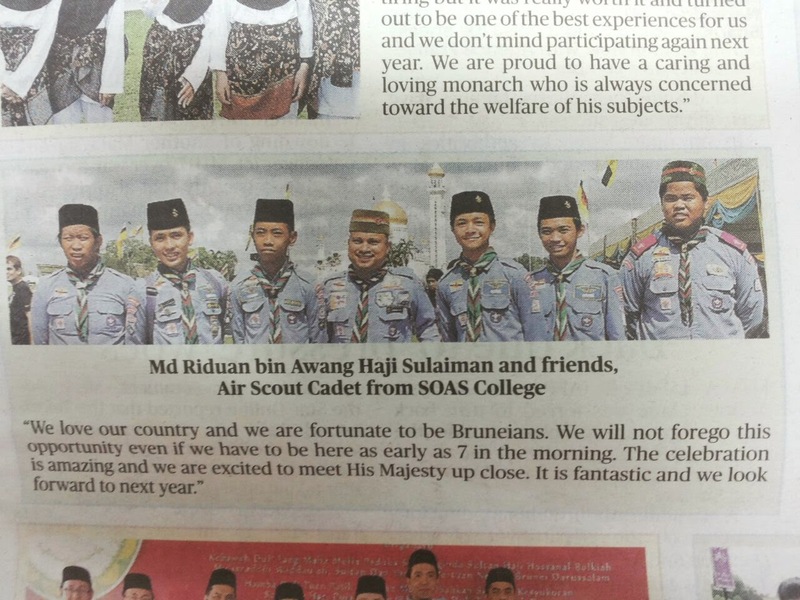 The delegation went around Brunei and Miri with the help of dedicated Patrol Leaders for SOAS College Air Scout. Although the visit was short, they had they were received by an official dinner hosted by PPNBD. There they met Skipper Haji Badar, the Chief Commissioner of PPNBD and other friendly commissioners. We hope that there will be more visits from other countries in the future. 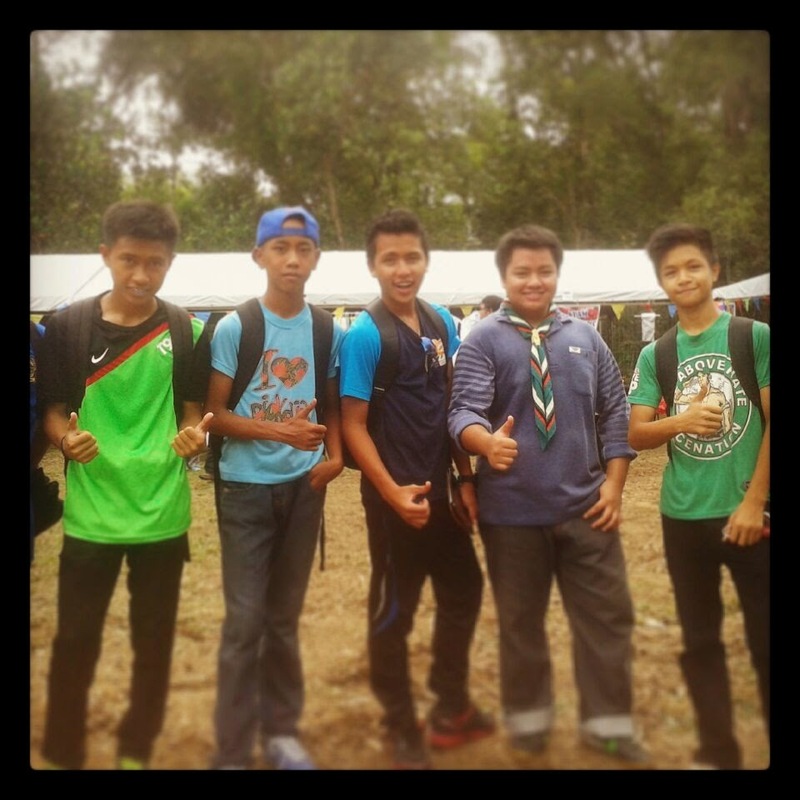 SOAS College Air Scout was invited to Sabah for the upcoming Campboree in November. SOAS College Air Scout Troop experienced real flight simulators in CAE MPTC Brunei yesterday. The group was made possible by CAE management and the briefing was made by CAE Brunei MPTC Deputy General Manager, Mr. Rozman Junaidi. The educational visit was a first where students were allowed in and some tried flying fixed winged and helicopters around virtual map of Brunei. After a short briefing, the group was taken to do instrument panel familiarization. Pilot Instructor Jasmin demonstrated how to fly the SU92 which is activity used by Brunei Shell Aviation. Emphasizing academic excellence and physical well-being are key to become competent pilots. 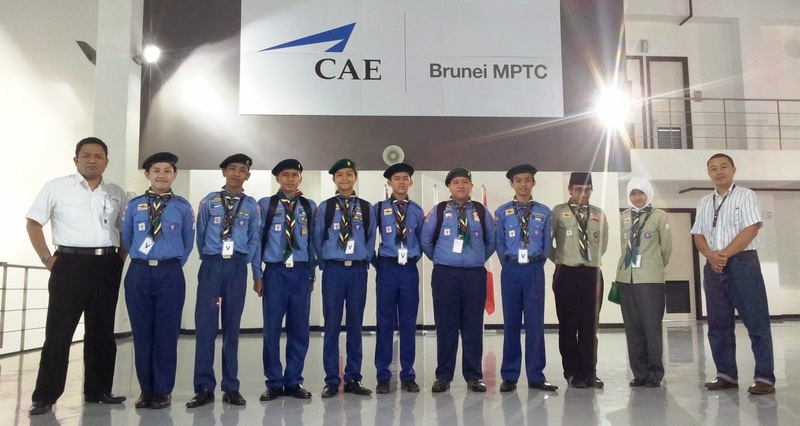 SOAS College Air Scout Troop would like to thank CAE Brunei MPTC for such an inspiring visit. All of the students can see their future prospects and strive to get good grades to become Brunei's future aviators. 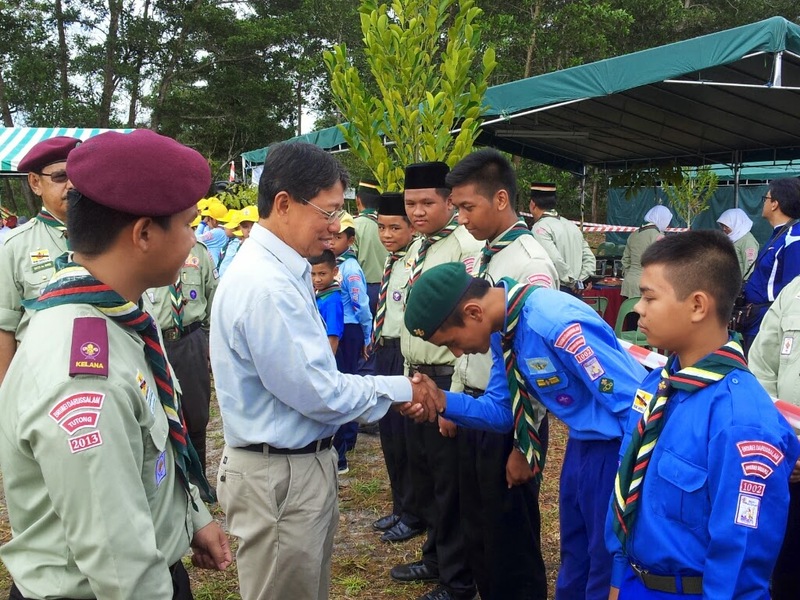 Bersama Rakyat is one of the great events of the year where scouts can meet the king. Right after the Sultan Birthday Celebration, the Sultan goes around to all districts to meet up with loyal subjects. SOAS College Air Scout never miss assembling in town for this auspicious occasion. Sometimes the king will stop and have a moment to talk with scout members. 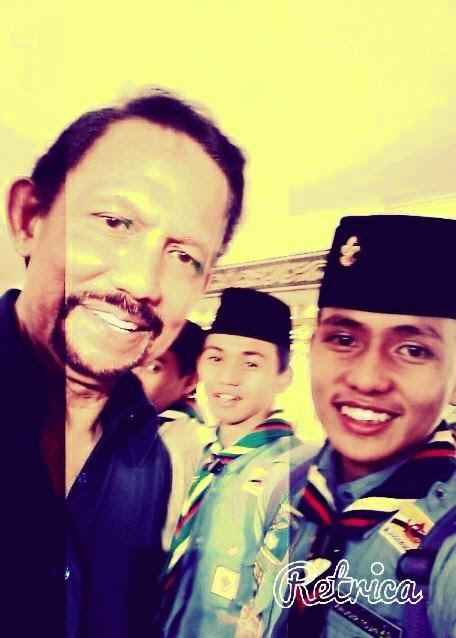 Though not common practice, the Sultan sometimes allow "selfie"moments with scout members. One of our patrol leaders had the golden opportunity to do this with the king. The occasion was also covered in the news paper and our troop picture was one of the highlights. This is indeed one of the memorable moments for scout members that would never come again once they have grown up and move on to adulthood. 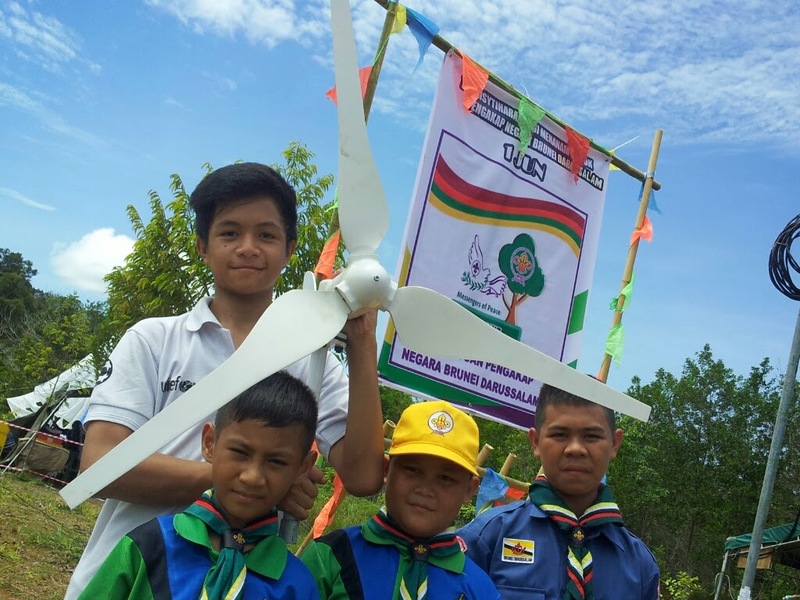 In conjunction with Tree Planting Day and Environment Projects, Troop 1002 from SOAS Air Scout introduces the use of renewable energy as part of their "Messengers of Peace" Project. 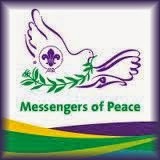 Messengers of Peace is worldwide drive for scout members contribute in projects regarding peace in their respective countries. 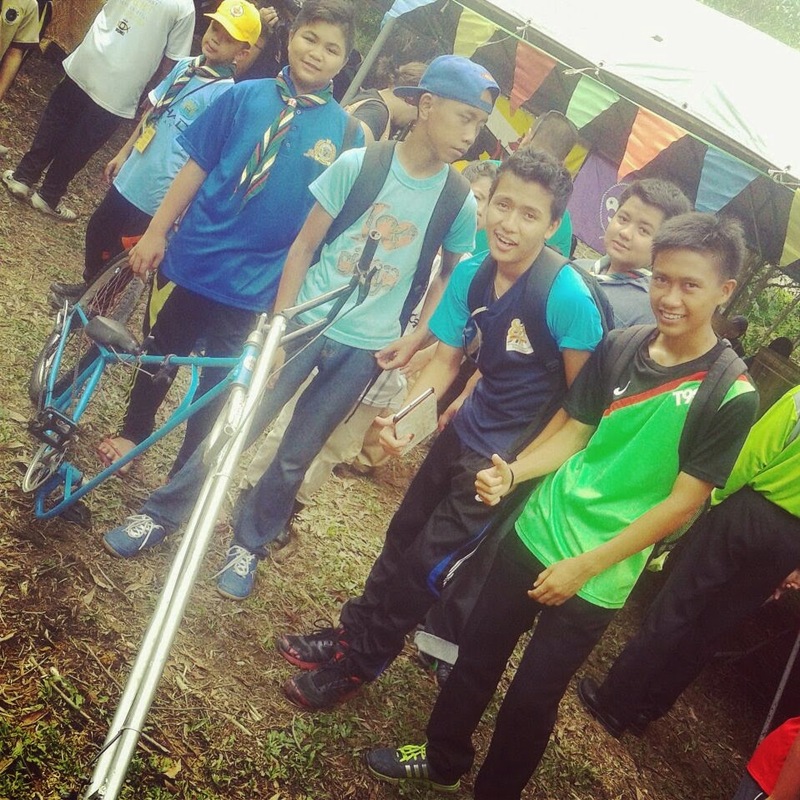 It was showcased to the President of Brunei Scout Association as well as the visiting Minister of Industry and Primary Resources during the camp. Harnessing wind energy, a wind turbine is used to charge a used car battery that in turn power a few 12 volt bulbs. This is useful because most remote or new campsites do not have electrical supply. Previously scout uses kerosene lamps and candles to light up a campsite and this had many close calls and still poses fire hazards in a our fragile jungle. With new experiments like solar energy to charge hand phones and wind energy to light up campsites, the scouts hope that this can be adapted by other troop and someday sees a campsites that are energy-efficient and friendly to the environment. 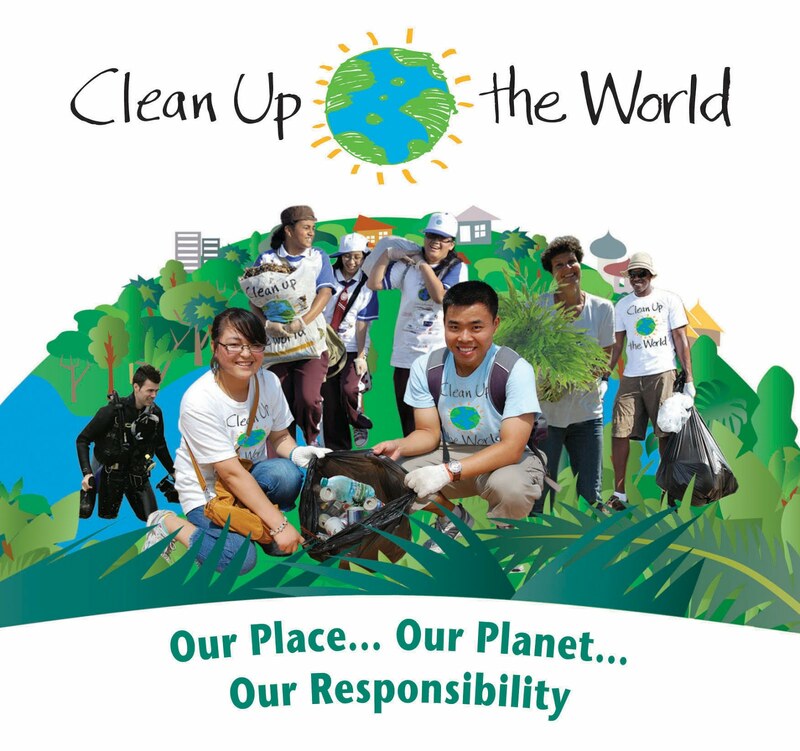 THE Brunei Darussalam Scouts Tree Planting Day campaign was officially launched yesterday and will be held every 1st of June starting this year. Speaking during the Brunei Darussalam Scout Association’s 4th Environmental Camp programme, Minister of Industry and Primary Resources Yang Berhormat Pehin Orang Kaya Seri Utama Dato Seri Setia Hj Yahya Begawan Mudim Dato Paduka Hj Bakar commended the initiative undertaken by the Brunei Darussalam Scouts Association in supporting the conservation of the forest resources and keeping the environment green, which is a continuous programme under the Ministry of Industry and Primary Resources. 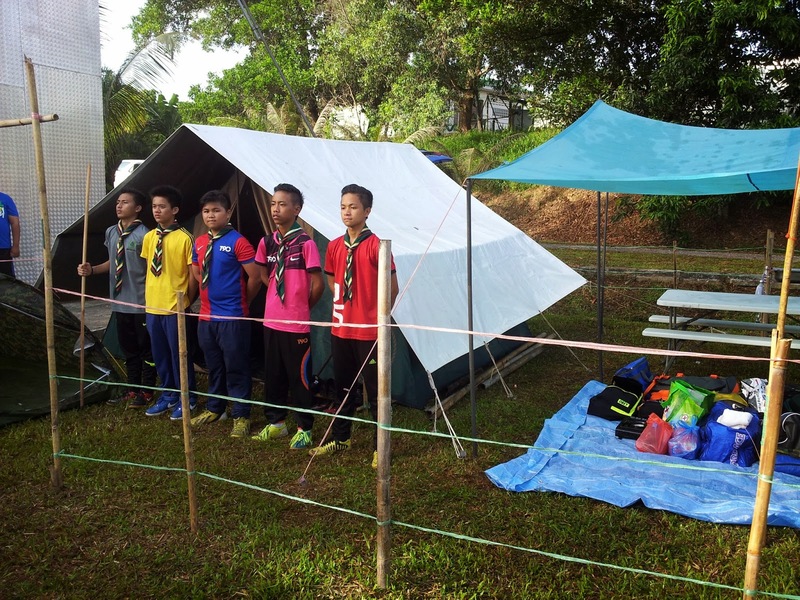 According to a statement by the Brunei Darussalam Scout Association, the Environmental Camp was first introduced in 2008 to inject the attitude and awareness of caring for and conserving the environment among the scout members. 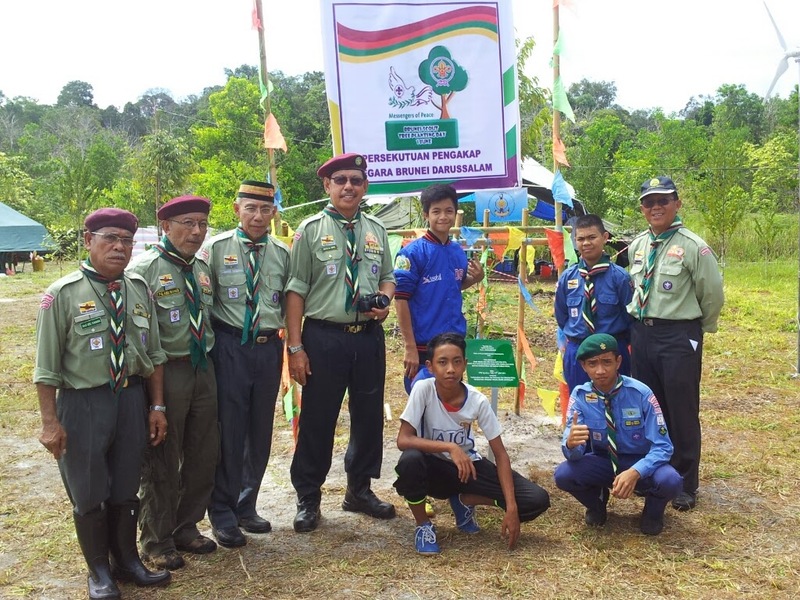 The three-day camp was held from the May 30 to June 1 and at the Brunei Darussalam Tree Planting Project Site, located at KM 12, Kampung Sungai Mau, Jalan Labi-Liang, Mukim Bukit Sawat, in Belait District. 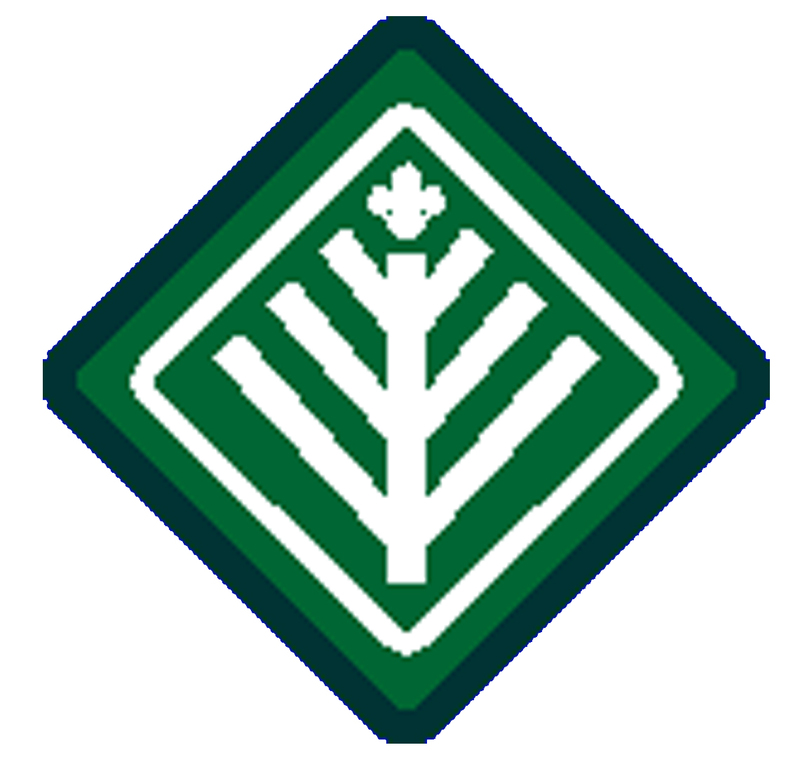 The minister said that initiatives of the scout association enhances their image as a ‘Green Partner’ to the ministry and said that the scouts association’s participation was unique because of its involvement and approach, not only focused on planting trees alone but also caring for the trees that have already been planted. The concept for the 4th environmental camp was also consistent with one of the Forestry Department’s green initiative programmes — ‘Greening the City, Saving the Planet: Making a Difference, One Tree at a Time’, which was launched back in March. To officially launch the Brunei Darussalam Scouts Tree Planting Day the Minister had proceeded to plant a tree after making his speech. 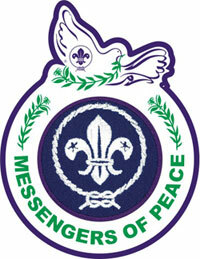 The Brunei Darussalam Scouts Tree Planting Day is also a part of a ‘Messenger of Peace Initiative’ which is a global drive where scout members contribute in projects regarding peace in their respective countries. 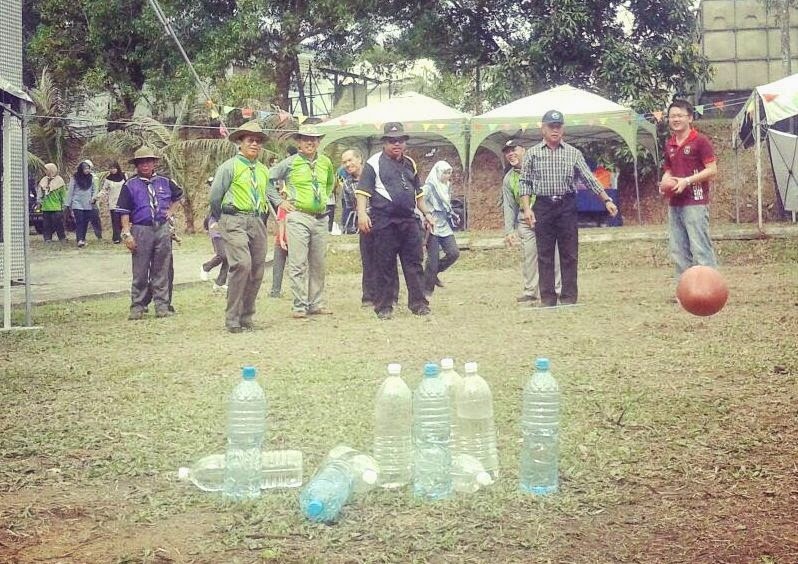 Other activities held during the environmental camp included an educational visit to the Pusat Biodiversiti Hutan Tropika (Tropical Forest Biodiversity Centre), a getting to know the planted trees session and social work at the Masjid Kampung Sungai Mau with the tree planting session being the main event yesterday. 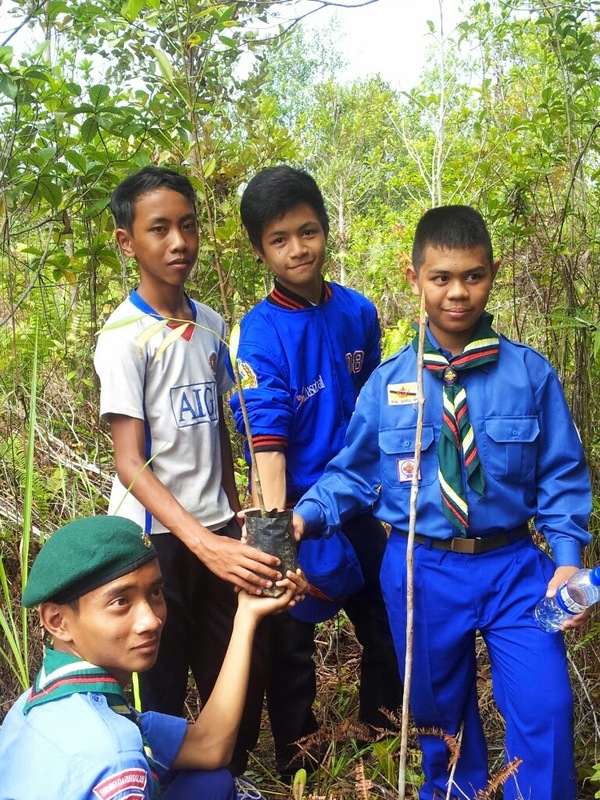 Over 140 trees were planted and around 200 scouts from around the country were present including some from the Malaysian Scout Association from Miri. 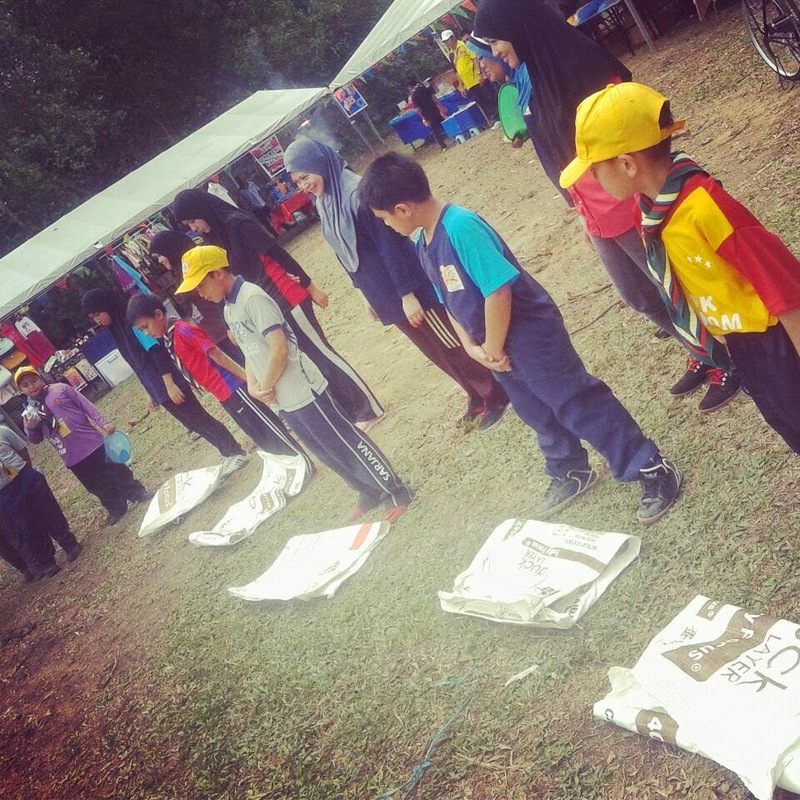 THE Brunei Darussalam Scout Association (PPNBD) organised and celebrated the Brunei Scout Day 2012 at its headquarters in Beribi with a list of fun games, booth sales and many more. Present during the celebration was the president of the scouts association, Dato Paduka Hj Idris Hj Abas said, as well as senior scout members, officers and scout leaders from around Brunei. Also present were representatives from the Ministry of Culture, Youth and Sports and Ministry of education, among others. The PPNBD Scout day was organised to commemorate the 79 years of service and establishment of the association in the country, playing its role as an organisation which assists the community and guides the younger generation, developing youth according to the aspiration of the country. 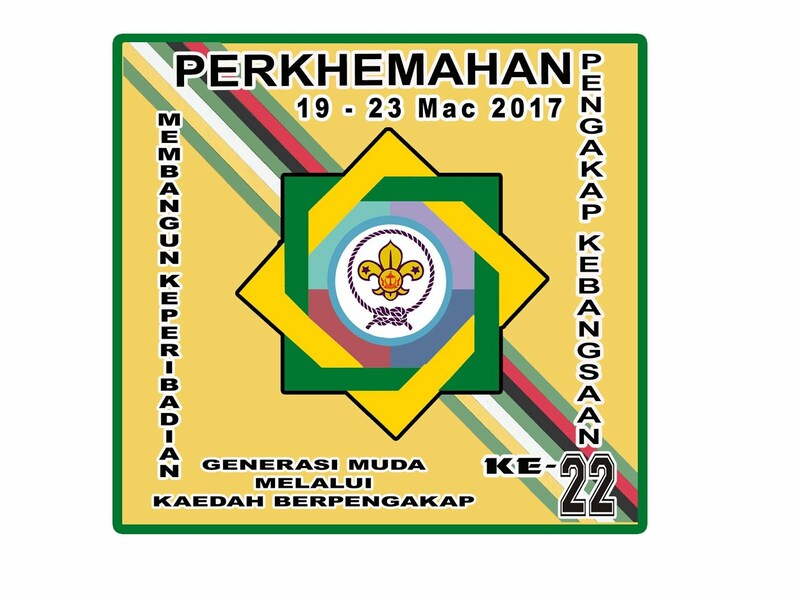 The theme for this year's celebration is "Pengakap dan Keluarga Harapan Kita ", which loosely translates to "Scouts and family are my hope". The event was packed with fun filled family oriented activities. An exhibition was also set up where members of the public and members of the association alike are able to familiarise and gain knowledge and review the progress the association has made throughout the years. 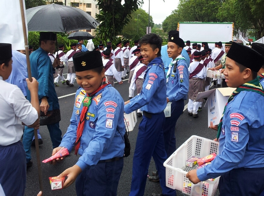 Brunei Scouts Association hosted the annual "Family Day for Scouts and Family" yesterday. But just before that, SOAS College Air Scouts called all parents for BBQ night. This was the ideas from members to keep parents informed and have nice outdoor meals cooked by the patrol leaders. No official discussion, just casual gathering and keeping everyone informed. It was also an honor to be visited by high ranking commissioners who also promotes new ideas and see what troops are up to these days. Everyone enjoys such casual gathering and good food and should be organized frequently. Already the troop and some parents are talking about having on at the beach. All in all it was a great success and everyone had fun. Dato Paduka Idris, who is our President and distinguished guest, inaugurated a Kite Fest for Scouts and friends of scouting. The event took place in Tungku Beach where many turned up and crowded by beach go-ers. 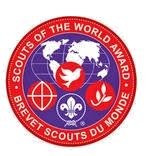 The event is the first of its kind and it was part of the many innovations scout leaders have made for modern-day scouting activities. 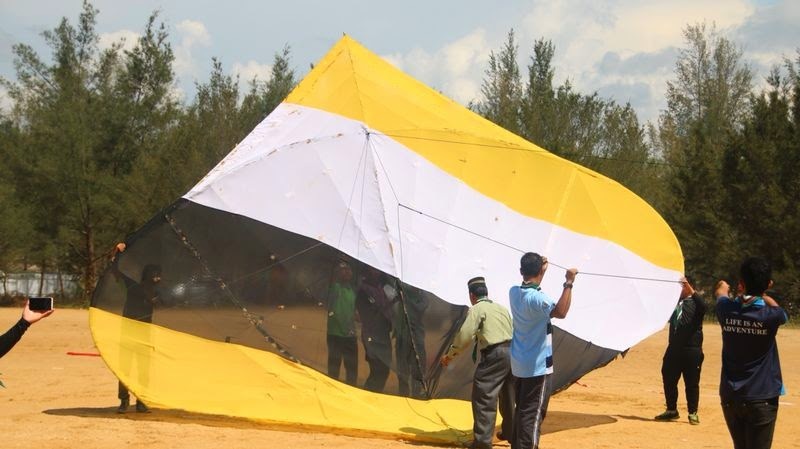 The highlight of the event is the largest kite ever made by scout members and was launched by the President of Brunei Scout Association himself. Skipper Rakub who supervises the making of the large kite made the event possible. In conclusion, the event was a huge success and scouts all over the country look forward to next years kite fest. 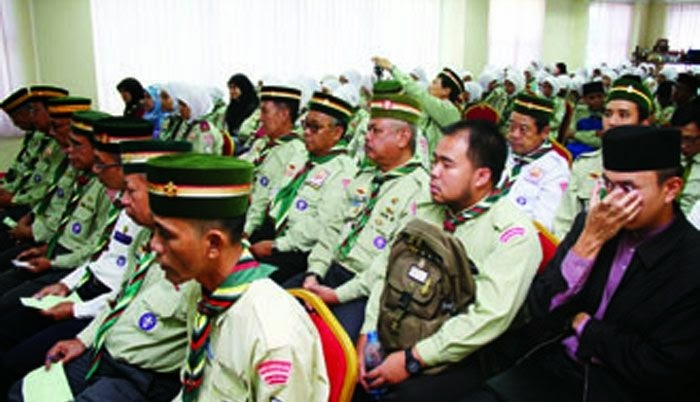 BANDAR SERI BEGAWAN: As part of the government's efforts towards familiarising all levels of society with the upcoming Syariah Law, the Brunei Darussalam Scouts Association (BDSA) recently hosted government officers who have been tasked to disseminate information related to the implementation. More than 200 scout members comprising Scout Commissioners, Scout leaders, Rover Scout, Venture Scout, Junior Scout, Sea Scout, Air Scout as well as Scout officers attended the briefing that was held at the Scout's headquarters in Gadong. In attendance as well were the BDSA Vice President, Pengiran Abdul Wahab bin Pengiran Hassan and the association's Chief Commissioner, Haji Awg Badar bin Haji Awg Ali. Following the briefing, the panel that included officers from various departments also held a question-and-answer session. Further information can be obtained by visiting www.kanunsyariah.gov.bn. With the on-coming monthly tests before first-term break, members are urging skippers for an adventure. Due to this, patrol leaders were asked to organize an overnight activity with some elements of cycling. The “cycling camp” was held in Taman Tasik Sarubing in Subok, after permission granted by the principal and the Mukim Subok Council. The night was filled with fun activities and prayers in the Kampong Subok Mosque. Learning to use available materials for BBQ was interesting. Best of all is learning to use materials that are friendly to the environment. SOAS College Air Scout Troop starts the year with registration activities and celebrating Prophet Muhammad birthday also known as “Maulud Nabi”. 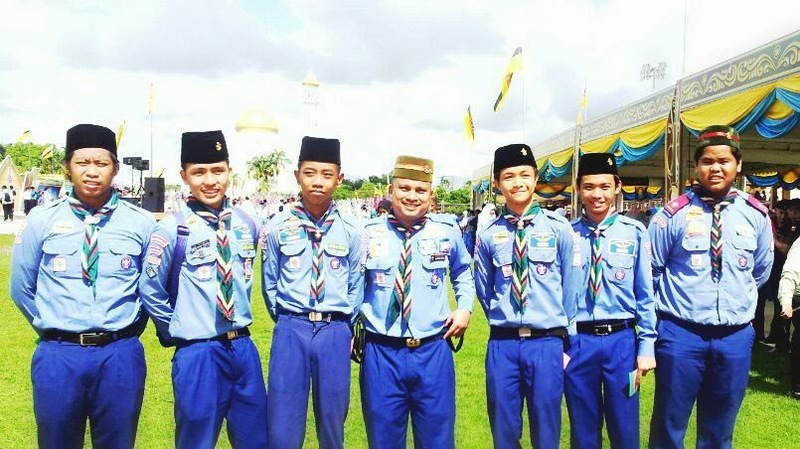 The auspicious occasion is traditional in a sense that it is done every year and being the “Sekolah Bandar” or Town School, SOAS College scout troop are always present to participate or assist in a service.